Udyanotsav - 365 Festivals :: Everyday is a Festival! Spring gives various reasons to celebrate. The budding of flower and charismatic sunshine adds beauty in every scene. It was that part of the year when every day felt like a festival. Furthermore, the Udyanotsav also commences in around this time. It is quite sure that you know about it if you are living anywhere near Delhi. If you aren’t familiar with it, this article will help you understanding firmly to its details. Udyanotsav is a festival dedicated to flowers. It went down every year in February or March. Moreover, the destination where it holds was none other than the Indian President place. You can’t afford to miss the beauty of this fest. Lots of beautiful flowers around you where you find many of the rare species that you don’t usually come across. Also, during the Udyanotsav the Rashtrapati Bhavan, the formal name of Presidential place opened for the common man to visit. Like other years this year to the festival will kick off on 6th of February and will continue till 9th of March. 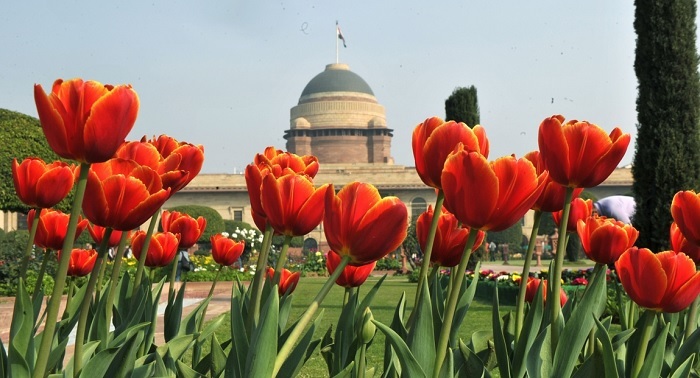 The door of beautiful Mughal Garden located in the Rashtrapati Bhavan will remain open till 4 in the evening. During medieval period in India, there are many such gardens laid by Tughlaq rulers. Mughal garden was indeed a beautiful part of the Rashtrapati Bhawan sited at the back of it. It spread in 13 acres which spilled into three sections namely rectangular, circular and vertical. The garden has the essence of British and Mughal architecture. Speaking about this, its designs credited to Sir Edwin Lutyens imbued with Mughal style. Moreover, the vibrant display of flowers here lodged beautifully in the rows and square beds. The rectangular garden also is known as the central garden further divides into four rectangles. These rectangles divide flowing from north-south and east-west. Each of these rectangles sided by terrace gardens on its north and south side. Moreover, the six-lotus shaped fountain present over every channel crossing is another vital piece of attraction. The next part of the garden called the Long garden. The long garden is extraordinary for its hundreds of roses variety making it the most scenic view ever. This garden surrounds with 12 feet high walls all across it. The final one in the garden list is the circular garden. At the circular garden, the flower planted are of annual budding. It consists of terrace bowl garden and a fountain in the middle of the garden. As soon this place opened for the visitor, there are several visitors from different part of nation arrives at the Mughal garden. Believe it or not, last year apparently 7 lakh people attended it. People not just enjoy the beauty of this place but also came to know about the process of forming compost. Again, this year the Roshni Programme an initiative towards environment issues will get to show the visitors. If you are waiting to experience an actual flower fest, it is the right time. There are many things which make you amazed no doubt. Moreover, you can enjoy the scene of 10,000 tulips and 250 variety of roses. Undeniably, the Bonsai garden, vertical garden, and cactus garden will make you stand still with its exquisiteness. On top of it, in the evening it becomes the home of peacocks who stroll with their partners.